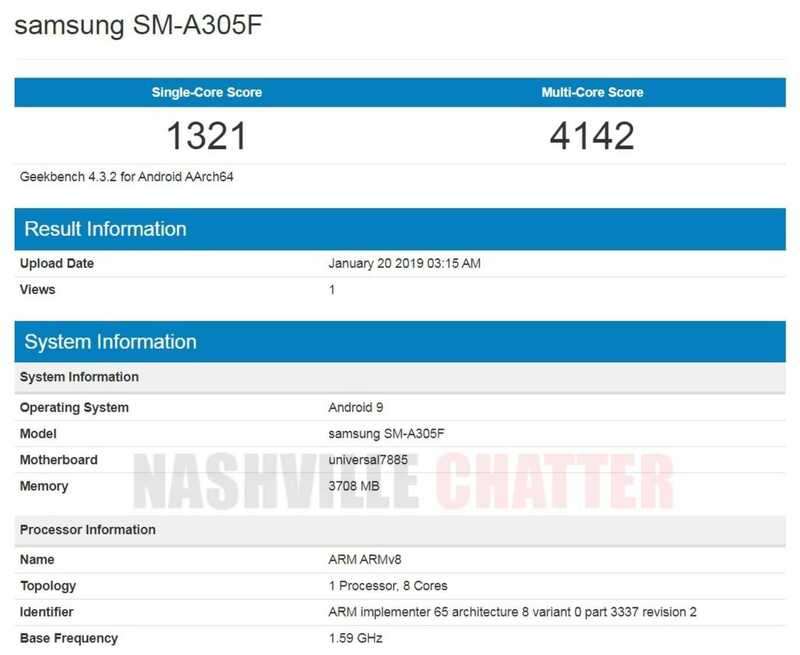 Samsung Galaxy A30 with model number SM-A305F is the next in the Galaxy A series of phones to appear in Geekbench after Galaxy A40 and Galaxy A50. The Geekbench listing reveals that the device will be powered by Exynos 7885 processor, which is usually present in several mid-range Samsung phone these days. This is a 4GB RAM variant that has been found in Geekbench and it also confirms that the device will ship with Android 9 Pie out of the box. Over the past few days, we’ve also seen Galaxy A40 (SM-A405F) and Galaxy A50 (SM-A505F) in Geekbench listings. Galaxy A50 is powered by Exynos 9610 S0C, making it the first phone from Samsung to use Universal 9610 processor whereas Galaxy A40 has the same Exynos 7885 SoC as with Galaxy A30 found today. The Geekbench scores for Galaxy A30 are 1321 for single core and 4142 for multi core performance. Galaxy A40’s single core score is 1311, which is almost similar to that of A30 whereas the multi core score of A40 at 3861 points is considerably less than A30 which has 4142 points, which is a bit surprising. Recently, Sammobile confirmed that as many as ten new devices will be released in Galaxy-A series in the first half of 2019 but the availability may be subject to select markets, as these are targeted mainly towards Asian countries. The model numbers we have already seen in Geekbench are SM-A305, SM-A405 and SM-A505. The ones yet to show up are SM-A105, SM-A205 SM-A202, SM-A705 and SM-A905 and we can expect these to appear anytime in the coming weeks. Another report claims that at least half of these devices will come with in-display fingerprint sensor. Samsung is expected to reasonably price these phones to counter competition from Chinese brands.